John Quigg felt now is the right time to leave Derry City. JOHN Quigg admits he’s disappointed how his coaching career at Derry City has ended but felt he had little option but to leave his position. The ex-Derry City defender left the Brandywell club after over a decade of service in his position as youth coach. Quigg felt the drastic changes made by Youth Academy Director, Paddy McCourt in such a short timeframe, made it clear to him that it was time to leave the club. Following his appointment, the former Celtic winger has replaced all the youth coaches with the exception of Eddie Seydak. However it’s believed the former Limavady United manager will follow Quigg out the Brandywell door in the coming months. “First off I haven’t fallen out with anyone and I want to state that straight away,” insisted Quigg. 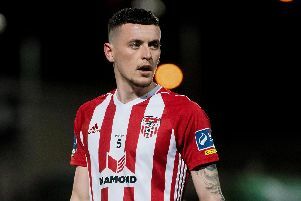 “Derry City is my club but I feel the changes Paddy has made, and there has been a lot of changes in a short spell, has meant I feel I need to move on. Quigg, who came to the club in 2006, admits he’s going to take time out but wants to return to football in the future and hasn’t ruled out management. “For the last six or seven years I have been running Derry City’s U19’s and then the Ulster Senior League side and that takes up 50 odd weeks of the year, so I’m going to take a break,” he stated. “However I feel I want to manage a senior club at some stage in my career, but we’ll see what happens. “I will also keep an eye on all the youth teams at Derry City because I want them and the club to progress. As I said, Derry City is my team and I will always be a fan. Meanwhile, McCourt was full of praise for Quigg’s efforts in a statement from the club this week. “Derry City FC wish to put on record our sincere thanks to John for 13 years of quality unbroken service,” said McCourt.